WHEREAS, in the Providence of God, victory having crowned the forces of the United States of America, in upholding the principles of the Nation against Great Britain in the conflict known as the War of 1812; we, the survivors and descendants of those who participated in that contest, have joined together to perpetuate its memories and victories, to collect and secure for preservation, rolls, records, books, and other documents relating to that period; to encourage research and publication of historical data, including memorials of patriots of that era in our National history; to care for and when necessary, assist in burying actual veterans of that struggle; to cherish, maintain and extend the institutions of American freedom, and foster true patriotism and love of country. Section 1 – The General Society is incorporated as a non-profit corporation in the Commonwealth of Pennsylvania, with corporate headquarters being located at the office of the Secretary General. Section 2 – The General Society shall be composed of State Societies and members-at-large as hereinafter provided. Section 1 – The officers of the General Society shall consist of a President General; a Deputy President General who shall perform the duties of the President General in case of disability of the President General or of a vacancy in the office; such District Deputy Presidents General representing regions encompassing State Societies as authorized; a Vice President General for members-at-large; a Vice President General for public relations; a Vice President General for publications; a Vice President General for each State Society and who shall be nominated by his respective State Society; a Secretary General; a Treasurer General; a Registrar General; a Genealogist General; a Historian General; a Surgeon General; a Judge Advocate General and who shall be an attorney-at-law; a Chaplain General; a Marshal General; a Quartermaster General who shall acquire, store and sell merchandise for the general society and such additional general officers and assistant general officers as may be deemed necessary by the Board of Directors. The Board of Directors shall have the authority to add or discontinue any general officer titles. They shall be elected at the Triennial Meeting of the Society, by and from members in good standing, and shall serve until the next Triennial Meeting or until their successors are duly chosen. The President General shall be ineligible for re-election after serving the full three-year term to which he has been elected. Completion of two years or less of the term of the previous President General wherein a vacancy occurred shall not render the incumbent ineligible for election to a full term of three years. Section 2 – There shall be a Board of Directors consisting of all the officers of the General Society mentioned in Section 1 above, all Past Presidents General in good standing, emeritus officers, and a delegate from each State Society to be chosen in such manner as it may provide. Section 3 – There shall be an Executive Committee consisting of the President General; Immediate Past President General; Deputy President General; Vice President General for Publications; Secretary General; Treasurer General; Registrar General; Historian General; and Judge Advocate General;. Section 4 – The Board of Directors shall, except as otherwise provided in the Constitution and By-Laws, have all the powers of a board of directors of a business corporation. It shall supervise the affairs of the General Society and transact such other business as may come before it. On nomination of a State Society it may fill vacancies occurring between meetings of the General Society in the office of Vice President General for aforesaid State Society. On its own initiative it may fill vacancies occurring in any other office of the General Society, except as hereinbefore provided in the case of President General. Section 5 – The Executive Committee shall have the powers of the Board of Directors between meetings of the Board. The proceedings of the Executive Committee shall be recorded and reported to the next meeting of the Board of Directors for ratification or change. Section 6 – The General Society is the supreme governing body and can exercise all the powers of the Society except as restricted by this Constitution and By-Laws. Section 1 – The regular meeting of the General Society shall be held every three years at a date and place to be determined by the Board of Directors, or in the absence of action by it, by the President General, provided the General Society itself may, if it chooses to act during a Triennial Meeting, to fix the date and place for the following Triennial Meeting. Special meetings may be called by the President General or on the request of two State Societies by the Secretary General. Section 2 – Such meetings shall consist of the officers, emeritus officers and Past Presidents General, of the General Society, each of whom except assistant general officers, shall be entitled to one vote; and a representation not exceeding five (5) delegates from each State Society (one of whom shall be the delegate to the Board of Directors of the General Society), which representation from each State Society shall be entitled to five (5) votes. Assistant officers shall be entitled to vote only in the absence of their respective superior officers. All members of the General Society by virtue of their membership in the several State Societies and as members-at-large may attend such meetings, but without the right to vote unless such right be granted specifically by resolution at the commencement of that meeting, and effective only for the duration of that meeting. Section 3 – Election of officers shall be by roll call of the State Societies unless an uncontested slate of nominees is presented by the nominating committee and no additional nominations are presented, in which instance a motion to elect the entire slate of nominees may be made. Section 4 – Meetings of the Board of Directors shall be no fewer than once annually at such time and place as shall be determined by the Executive Committee. The Executive Committee shall meet at the call of the President General, the Secretary General, or any three general officers. Section 1 – The Board of Directors shall have the right to admit new State Societies which, upon their admission, shall have not fewer than ten (10) members who are domiciliaries of the organizing state, and may hear and determine all questions affecting the qualifications for membership in or the welfare of any State Society as may, by proper memorial, be presented by such State Society for consideration. Section 3 – The members of each State Society shall be borne upon the membership roll of the General Society. Section 4 – The State Societies shall meet annually, on the day appointed therefore by their respective by-laws, and more often if they deem it necessary. Section 5 – The State Societies shall choose such officers for their own government and in such manner as shall be set forth in their respective by-laws, and shall transmit within the first three months of each year to the General Society a list of the officers and such other information as may be of interest to the General Society at large. Each State Society shall regulate all matters respecting its own affairs, and shall judge the qualifications of members therein, provided always that the action of such State Society be, in all instances, in conformity with the provisions of this Constitution and By-Laws, and the officers of a State Society whose duties correspond to those of officers of the General Society shall have similar titles. 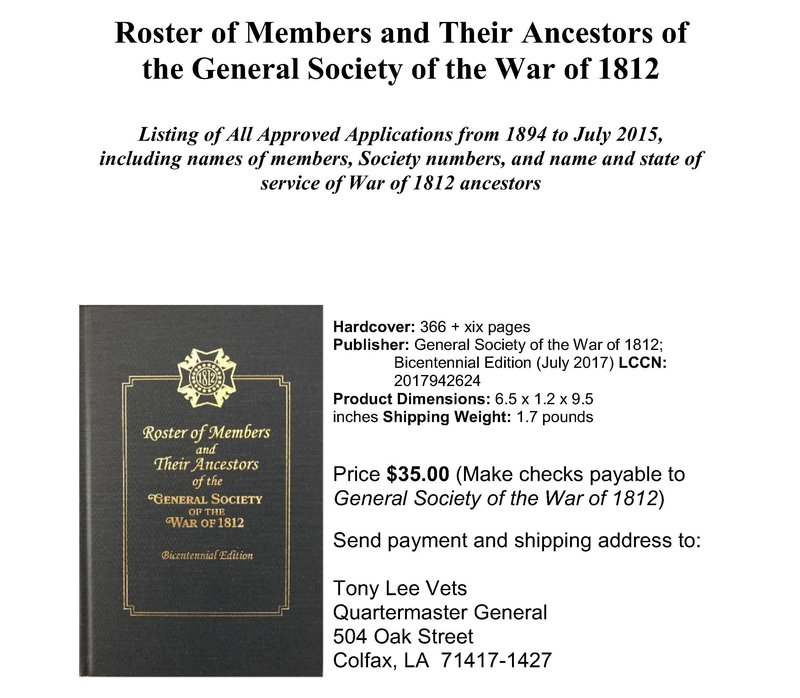 Any male person who participated in, or who is a lineal descendant of one who served during the War of 1812, in a military service of the United States, offering proof thereof satisfactory to the State Society to which he may make application for membership, and who is of good moral character and reputation, may become a member of this Society when approved of by said State Society, under such regulations as it may make for passing upon applications for membership. Collateral descendants, who are deemed worthy may be admitted to represent the said participant. Every application for membership shall be made in writing, upon such form as may be set forth by this Society for that purpose, which application shall be made in duplicate, and one copy thereof filed in the archives of the General Society. A member in good standing may file one or more supplemental applications based upon the services in the War of 1812 of either his direct ancestor or of one collateral. No State Society shall elect to membership persons resident within the territory of another State Society, except upon the written consent given in advance by the Board of Directors of the latter Society. Such consent shall be deemed to have been given if the latter Society fails to respond to a written request for the release of an applicant, within sixty (60) days of receipt of such request, which request shall have been made by certified mail return receipt requested. But members changing residence from one State to another or coming within the jurisdiction of a new State Society may, at their option, retain membership in the State Society in which they were originally admitted or to which they may have been transferred. A member of any State Society may be admitted to membership by action of the Board of Directors of another State Society within the bounds of which he is resident upon satisfactory proof of his membership and good standing in the Society from which he comes and subject to the rules and regulations of the Society he enters. Such member may retain his membership in his former Society or not, at his option. Any State Society, under such rules as it may establish, may admit to a qualified membership persons otherwise eligible who are under the age of 18 years, and may prescribe the terms, conditions and privileges of such membership. Members-at-large shall be elected by the General Society or by the Executive Committee upon payment of such fees as may be established by the General Society, but no person shall be elected a member-at-large who at the time of such election is resident in a State or District where a State Society exists. Member-at-large shall have the right to attend meetings of the General Society and those at attendance at any meeting may elect from their own number not exceeding four (4) persons who shall have all the rights of delegates under Article IV. Any person not qualified for regular membership as herein provided, who has rendered signal service to the General Society or to a State Society or to the history of the War of 1812 may by unanimous vote of the members present and voting at a meeting of the Executive Committee be elected to honorary membership in the General Society, if such election is on the recommendation of a State Society, he shall also by virtue of such election be an honorary member of such State Society. Honorary members shall be entitled to all social privileges of the Society and may attend all meetings of the General Society and of the State Society recommending them, with the privileges of the floor, but without the right to vote. Upon dissolution of the General Society, should such occur, the Board of Directors shall after payment of all liabilities, dispose of all the assets of the General Society exclusively for the purposes and in such manner to such an organization or organizations founded and operated exclusively for charitable, educational, religious or scientific purposes as shall at the time qualify for exemption under Section 501(c)(3) of the Internal Revenue Code as amended. Any proposed amendment to this Constitution shall be filed in writing with the Secretary General and the Chairman of the Constitution and Bylaws committee at least sixty days, and a copy thereof shall be sent by him to the President and Secretary of each State Society at least forty days, before the meeting of the General Society or of the Executive Committee at which the same is to be acted upon as herein provided. (1) Adoption at a meeting of the General Society by three-fourths of the votes cast at the meeting. (2) Adoption at a meeting of the General Society by a majority of the votes cast at the meeting and subsequent ratification by two-thirds of the State Societies. (3) Adoption at a meeting of the Executive Committee by a three-fourths vote of those present and voting and subsequent ratification by two-thirds of the State Societies. Ratification by a State Society shall be by a majority vote of those present and voting at a duly called meeting of such Society, due notice of the proposed amendment having been included in the call for the meeting, unless any State Society shall by its own by-laws provide a different method of ratification, in which case ratification by such State Society shall be given in the manner prescribed by its by-laws. Whenever by the provisions of this Article, ratification by two-thirds of the State Societies is required, notice of the adoption of the amendment by the General Society or the Executive Committee shall be forthwith sent by the Secretary General to the President and Secretary of each State Society and each State Society shall forthwith notify the Secretary General of its action thereon and at any time succeeding six months from the date of notification to the State Societies reporting shall have ratified said amendment, the same shall be in force as a part of this Constitution. Nothing herein contained shall prevent the General Society or the Executive Committee from changing the form of any proposed amendment submitted to them, provided such change does not introduce any new matter, except such as restricts the scope of the amendment or lessens the change in the then existing provisions of the Constitution.